QRemote Control allows registered users to execute programs on the IBM i remotely. To execute a program, the user sends a text message (SMS) with a specific command to QRemote Control. The command specifies an exit program. An exit program in QRemote Control and QMessage Monitor is a standard IBM i program that has been registered with QMessage Monitor. Despite the name, exit programs in this context are not related to exit point processing. A GSM terminal. CCSS can advise you on GSM terminal hardware. Only supported hardware should be used. Determine who should be authorized. Register the program as an exit program. Receiving a list of held job queues. Receiving a list of jobs in (Inquiry) Message Wait. Checking if a particular batch job is active. Get information from the STOCKS file. Code an IBM i program in the high-level language of your choice, for example, C, CL or RPG. Use the following information. Between 0 and five parameters can be specified by the user in the text message in addition to the command itself. Using the SNDPGMMSG command. Any messages sent by the top level program will be joined together into one or more SMS messages, which are sent back to the sender. To mark a message as private, send the message *PRIVATE first. Using the PGSMS command. You can use the PGSMS command in a CL program to send messages to the user (or to another user). Messages will be sent immediately, and the usual confirmation options are available. You can also specify private messages using this method. Private messages will not have their text displayed by the status and history functions. Using the LDA. Set the first four bytes of the LDA to *SMS or *SMP. The remaining 560 bytes will be turned into a message (or messages) and sent back to the requesting user. *SMP is used to specify a private message. File MMSRC is shipped with the QMessage Monitor product. Amongst others, this file contains a number of sample programs that can be used as a QRC exit program. It resides in the QMessage Monitor product library on the host system. Exit programs are compiled in the same manner as any other IBM i programs. We suggest that you compile programs to library MMUSR on the QMessage Monitor host system. The next step is to get these newly created programs onto the other systems/partitions in the QMessage Monitor configuration. This can be achieved using the MMSNDUSR command, which will ship the contents of library MMUSR on the host to all other systems in the QMM configuration. Determine which persons you would like to be able to use these commands. If they have not been set up as escalation users in QMessage Monitor, add them now with their mobile phone numbers. In the Maintenance module, in the Main section, create an authority list that will be used to control use of the exit program. Add the users determined in the preceding step, and give them “Allow Execute” authority. In the Maintenance module, in the Main section, for each user, set the authority to a value other than “Not Authorised to submit requests”. 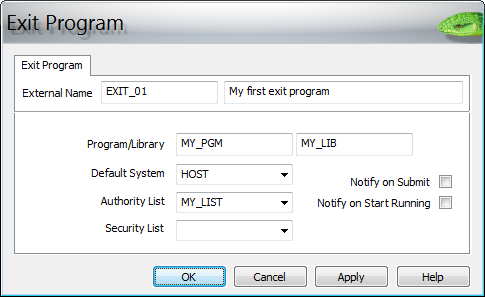 In this example, program MY_LIB/MY_PGM is being registered as exit program EXIT_01. The Default System is system HOST. The exit program can only be executed by members of authority List MY_LIST. EX is the QRemote Control command for running an exit program. MY_SYSTEM is the name of the system on which you want to run the exit program. EXIT_01 is the External Name of the exit program. QBATCH is the first (and in this case only) parameter that is passed to the exit program. This calls the program associated with the External Name, with the parameter QBATCH. The program could then, for instance, return a list of jobs currently running in the QBATCH subsystem. As with any communications, the use of exit programs has to be evaluated from a security perspective. Sender number verification As with any command sent to QRemote Control, the sender’s phone number is compared against the numbers that have been configured in QMessage Monitor as escalation user phone numbers. Only if the numbers of the sender matches one of the numbers for an escalation user, processing of the command is performed. Authority Lists An authority list can be associated with an exit program. An authority list is a named list of escalation users. The authority list controls which escalation users, identified through the senders’ phone numbers, can execute a particular exit program. Prepared commands Exit programs function similar to “prepared statements” in SQL. They allow to which functionality is made available to users. This reduces the security exposure in comparison to unlimited access to IBM i commands. These security features mitigate the risk associated with any communication. Nonetheless, it is up to you to determine if these features match your organization’s requirements.